I’m Mike Cintolo, and I don’t have to tell you there are no perfect stocks or easy doubles. There never have been and there never will be. Yet, we’ve identified a stock that’s pretty darn near perfect and one of the easiest doubles we’ve seen this year. What’s more, the company has delivered four earnings surprises in a row—and get this—has beta of 0.91! The company has less volatility than the market and the sales and earnings momentum to continue to deliver annual double-digit returns. So it’s not a surprise that 12 top analysts have revised the company’s performance for this year. So what, exactly, makes this an almost easy double? The fact that 9 out of 10 investors have never heard of it and will miss out on this locked-in opportunity. The financial media isn’t writing about it. Nor are the brokers recommending it. Yet, it’s on track to double investors’ money again, just as it has twice over the past two years. Surprisingly, and just like Amazon, it’s also an online retailer. That’s why I’m writing: to tell you about this company that’s set to double investors’ money again in 2019 … and become the next Amazon along the way. I can say this because we were one of the first to not only recommend and profit from Amazon, but also recommend and profit from Apple, Taser, Crocs, Netflix, Yahoo and XM Satellite Radio before they became household names. I’m not the only one who sees this company becoming the next Amazon. Wall Street’s top institutional investors do too, owning millions of shares worth more than $6 billion. Over the past two years this company handed investors 100% more gains than Amazon, Apple, Facebook and Google—that’s 206% to 99%, 26%, 20% and 36%, respectively. That’s because the company’s low price point products appeal to the fastest growing demographic on the planet: millennials. Unlike Amazon, which sells everything under the sun, this near perfect company has carefully targeted its market to teens, pre-teens and their parents—selling them must-have, in-demand, fashionable items along with seasonal must-haves for Easter, Halloween, Christmas and more. But time is running out on getting in on the ground floor here. With the company’s stock price doubling in two years, 5 top analysts giving the company a STRONG BUY rating, and top institutions investing over $6 billion, we see the company’s cash registers working overtime this holiday season. If you can get in at today’s low prices, you could easily see your money jump 50% after they announce earnings and then double again the next two years. Hold longer term—five to 10 years—and you could easily see a $10,000 investment grow well into $100,000. With our time-proven technical indicators forecasting a MAJOR BREAKOUT ahead for this retail juggernaut; this is not an opportunity you want to sit on now. In order to help you get in, I’ve put together a special report titled The Next Amazon that will give you all the details on this company, including its name and stock symbol. This report is yours, absolutely free. All I ask is that you give my Cabot Growth Investor investment research advisory service a risk-free try. Remember, the report will give you all the details on the retail company that’s about to see its profits skyrocket. In a world where hundreds of financial investing advisories come and go yearly, Cabot Growth Investor has stood the test of time. Not only delivering 49 years of profitable investing advice but also doubling our readers’ money 29 times along the way—all thanks to our time-proven technical system our founder, Carlton Lutts, created in 1970. Get the name of this retail doubler. Plus get four additional FREE Reports. You’ll find nothing is easier, simpler or more profitable. As a result, Cabot Growth Investor has become one of the most respected, trusted, and profitable investment advisories in America and why thousands of Americans trust us to help them safely, securely and systematically build their wealth. That’s why we’ve made it possible for you to receive a free copy of The Next Amazon along with the opportunity to test-drive Cabot Growth Investor for the next 30 days risk-free. That way you can see for yourself how our profits stack up on all our recommendations without your risking a dime. Here’s the Best Part: Your Satisfaction is Always Guaranteed. When we started our advisory in 1970, we promised our readers that we would do everything within our power to make certain our clients would profit from our advice, or they would not pay a dime. Over the past 49 years, we’ve kept to that commitment by offering an unheard-of 100% money-back GUARANTEE. This means that if you’re not impressed and delighted with the profits you gain from our recommendations, just let me know and I’ll always send you a full 100% refund during your 30-day risk-FREE trial on your annual subscription. You may think that I’m sticking my neck out making a guarantee like this. I’m not really. 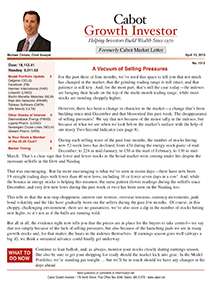 After all, the Cabot Growth Investor is one of a handful of newsletters that have been published for over four decades. When you deliver what you promise, people stick with you. Once you see everything, we believe you will too. Here at Cabot, our mission has always been not only to bring independent investors the most profitable and practical investment advice on the planet but also to bring it to you at the most affordable price. Naturally, I couldn’t offer you such a strong guarantee if I didn’t believe that Cabot Growth Investor would deliver as promised. With our 49-year track record for building wealth, I know you won’t be disappointed. So why not join us and test-drive Cabot Growth Investor on my dime before you make a final decision? With our 100% money-back guarantee, that’s quite a bargain, considering you can cancel at any time during the first 30 days and get all your money back. This is how Cabot Growth Investor has become one of the most respected and profitable investment advisories on Wall Street. If it’s just 1/10th as profitable as our biggest winners, you’ll grab 50% gains every six months or so and may never invest any other way again. Waiting until after the company declares earnings could make it impossible for you to get it at my buy below price. Grabbing it now will give you a head start in the race for profits—long before earnings come out and Wall Street bids this one higher. ✓ Download your FREE copy of The Next Amazon. ✓ Check out the explosive profits our recommendations can bring you. ✓ Take FULL advantage of my 100% satisfaction guarantee to decide if Cabot Growth Investor is for you. To make sure you don’t miss this opportunity to grab our retail doubler before it doubles again, now IS the time to join us. With my money-back guarantee, you have nothing to lose and everything to gain. Mark my words: Once you grab your first 50% gain, I’ll bet I couldn’t pry your subscription from your hand if I tried. I promise it will be one of the most profitable investing decisions of your investing life or your money will be promptly refunded. P.S. Remember—by simply saying yes today you’ll not only be able to test drive Cabot Growth Investor for the next 30 days … but also be able to lock in our lowest price. When you order now, you’ll find out the name of our retail doubler that could jump 50% on earnings and begin your trial subscription immediately.